Little Green Raincape is on her way to Rapunzel’s party, deep in the wild woods. The way is long and dark, but Green is a smart girl. Smart enough to turn down apples offered by kindly old ladies, smart enough to turn down travel advice from helpful wolves, and above all, smart enough to solve a wealth of classic fairy tale problems - not least mend a lovelorn beast’s broken heart. 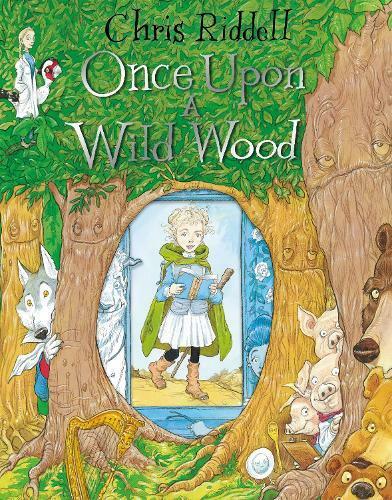 Once Upon a Wild Wood is a richly imagined story packed full of familiar fairy tale characters as you’ve never seen them before. Including Red Riding Hood, Thumbelina, Rapunzel, Beauty and the Beast, Cinderella, the three bears, the seven dwarfs and many more! A visual feast on every page, illustrated with warmth and humour and full of witty details to discover - this is Chris Riddell at his picture book best!